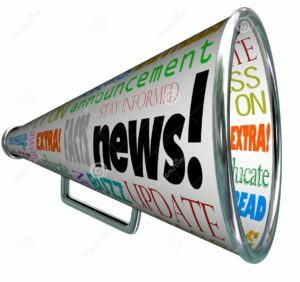 Open House Social April 12! New Clubhouse for Quail Ridge! Absolutely beautiful property, it's safe, secure and the people are amazing. Two fantastic golf courses and a wonderful practice area. The food at the Club is excellent and the location is perfect, close to Palm Beach and Delray Beach. It's a must visit Golf community. I wish to thank you for your good services when we decided to sell our house. 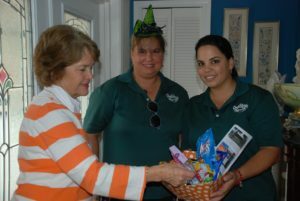 We are very grateful to you personally and the whole Quail Ridge real estate team. Very professional. All the best! Paradise!!! This is our place in the sun!!! Just a quick note to thank you! My wife and I moved from the west coast of Florida to Quail Ridge 7 years ago and have enjoyed every minute of our time here. Great golf, tennis and social activities. As an added bonus,especially for my wife, is the local shopping experience. Get out of the cold north and into the warmth of Quail Ridge Country Club! Quail Ridge Country Club is our home and an incredible place to live!!! Beautiful homes, beautiful golf!! Great place to make friends and enjoy all that south Florida has to offer. Get out of the cold north and into the warmth of Quail Ridge Country Club! 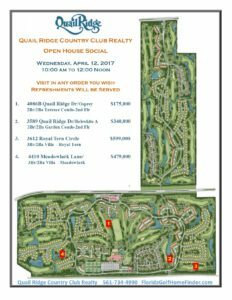 Quail Ridge is a friendly & active community centered on tremendous golfing experiences yet with plenty of other activities to stimulate a wide array of interests. The club is well managed and financially sound but the members make all the difference. Unbelievable value for first class golf, tennis,fitness and social activities! Awesome golf courses, golf staff, pros, food, tennis, gym--first class. Love Quail Ridge. Our experience at Quail Ridge is one of a lifetime! The amazing staff, and beautiful landscape, makes this place a little paradise! Great history and tradition at Quail Ridge....a golf haven in the heart of Palm Beach County. The former home of Sam Snead and Claude Harmon is now the current home of The Society of Seniors. This 36 hole facility, with large practice grounds, offers something for everyone. C'est extraordinaire , magnifique ...les golfs sont unique les villas superbes quoi dire de plus un 5 etoiles . Most beautiful and secure surrounding possible! Thank you for being such a good facilitator. It is easy to deal with someone that we trust and admire. Thank you for being you. Quail Ridge is a beautiful community with 2 fantastic golf courses, tons of tennis courts, great walking trails and beautiful landscaping. It is a secure community, filled with friendly people. The food is great and the staff is wonderful! Very happy to be a resident of such a wonderful place! Amazing amenities, atmosphere, views, clubhouse and people. We wouldn’t want to be any place else. Quail Ridge is a special place to live! Outstanding 36 holes of golf. Great people, easy to make friends and much to do. In addition to golf, tennis, fitness, walking trails and excellent dining and shopping. Near Delray and West Palm Beach. Unbelievable value for first class golf, tennis, fitness and social activities! Two fabulous golf courses, great tennis facilities, wonderful residents and staff….and excellent food and beverage, particularly the always popular wine tastings and gourmet dinners! Seven years for my wife and I and we just love Q.R.C.C! A Look Inside: Our New Clubhouse If you can't be here in person yet, we … Read more.. I am a big proponent of home styling- in particular decluttering. 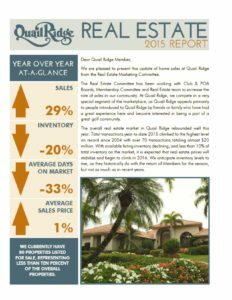 The following … Read more..
Quail Ridge Country Club Realty has been devoted exclusively to marketing homes within the Quail Ridge community for over 40 years.